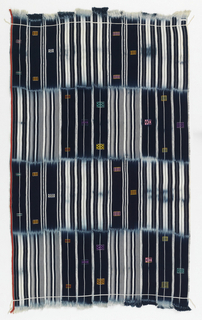 See more objects with the tag clouds, Japanese, checkerboard, lozenge, indigo, ikat. This is a Textile. It is dated late 19th century and we acquired it in 1956. Its medium is hemp or ramie and its technique is warp and weft ikat (kasuri) on plain weave. It is a part of the Textiles department.